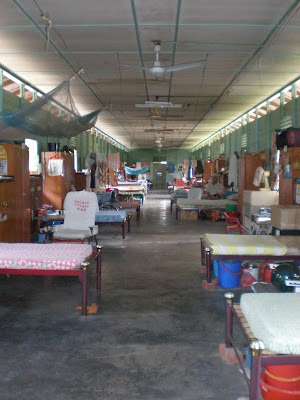 This was the old folks home in Jelapang which I visited last Friday. It was a charity trip organised by the yogee group. Our yoga instructor was going with us. Sometimes it is good to have some social life like this. My last visit to the old folks was almost 25 years ago when I was in secondary school. My yoga instructor was distributing the ang pao for them. Make them happy a bit even it was not that much in a packet. We had bought so much groceries, ready to contribute to these old folks, but to find out that they prefer to receive their sharing separately. We didn't have the time to distribute the groceries equally, so just gave them money was better. Our gang then left and headed Chemor for fish head noodle breakfast. Quite fun to mix around like this. They then moved on to another old folks home in Simpang Pulai. Anyway, I didn't manage to join as I had to pick my kids up from school. Maybe, we may have another round of charity activity soon.